Recently in the world of sports, we’ve heard about an extremely unsettling situation involving a prominent college football coach who may or may not have had knowledge of one of his former assistants abusing his (now ex) wife. It got me thinking about a few different responses to questions regarding marriage, divorce, and abuse and how we should respond to such things as followers of Jesus. 1. Does the Bible really say you can’t divorce even if you’re being abused? Regarding the issue of what Jesus says about divorce, there are two texts that it comes down to: Matthew 19:3-12 and Mark 10:2-12. At first glance, these two passages look similar by asking the question, “When is divorce permissible?” Jesus (eventually) answers than only adultery is grounds for divorce in the Matthew text, but no explanation is given in Mark and Jesus gives more room to fill in the gray areas. Here’s the thing, though. The Pharisees are trying to back Jesus into a corner in both of these passages, and Jesus refuses to play their game and sink to a level of legalism. Jesus pretty much shatters this kind of legalistic mindset in many other places in the Gospels, so why would he succumb to one on the issue of divorce? Jesus focuses on human beings, not rules that bind them. Instead of coming up with a list of when divorce is permissible, Jesus goes all the way back to the beginning, Genesis, and wants to talk about why marriage is there in the first place and why it is such a tragic thing when it doesn’t work out or when it is misused in personal power struggles. Marriage exists so that the kingdom of God can be more fully present on earth. A marriage is like a microcosm of what the world should look like, where you show love, grace, forgiveness, acceptance, inclusion, and service to one another. You share the good times and the bad times and get through both, together. It’s the ultimate expression of living in community. It should also be noted that the Pharisees had no regard for the well being of the women when they asked this question. Only men were allowed to divorce, and the most right a woman had (if she were handed a “certificate of divorce”) would be an allowance to get remarried should another man show interest. Jesus redirects the question to restore the dignity of women in the matter and also get back to the heart of things. 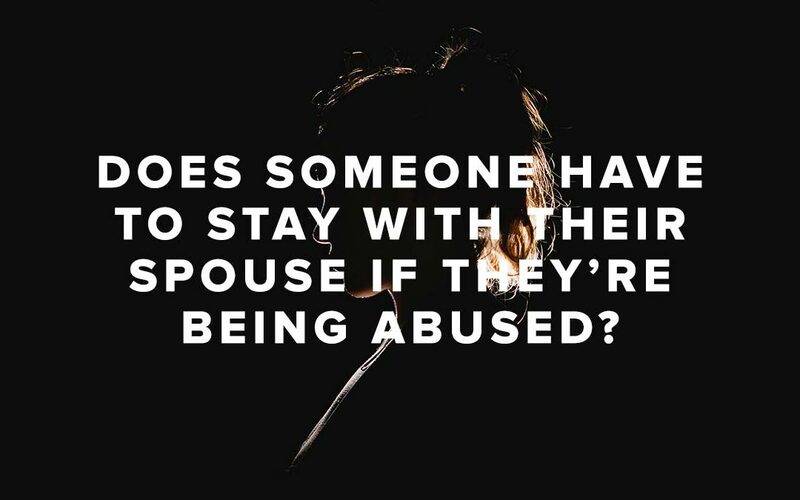 So, to answer this question: No, the Bible does not explicitly say you have to stay with an abusing spouse. However, to Jesus’ point, that doesn’t mean you can divorce people for any and every reason just because. 2. Is divorce really still a qualifying dilemma for people and leaders within the church? These sorts of verses have been used, in my opinion wrongfully, throughout the Church to disqualify people from leadership if they have been divorced, or remarried, and to also back women (and in some cases, men!) into a corner if they are in any sort of abusive relationship, and urge them to stay with their spouse no matter what. To this, I say exactly what I believe Jesus was trying to say when the Pharisees approached him, “Why do people get married in the first place?” If the marriage is not honoring God and has become abusive on any level, it needs to be addressed, confronted, and responded to appropriately. Otherwise, what’s the point of being married? Why subject yourself to such a horrible situation if you know that God wants the best for you? So, what would I say to a person who is being abused by his or her spouse on a mental, emotional, or physical level? Do your best to commit to the vows you voice to one another, and if it is clear those aren’t being attended to, then it’s time to address that. Jesus knows and resonates with what you’re going through, loves you through it all, and can still use you for the purposes he intends, even if you wind up leaving your spouse for your own safety or the well-being of the rest of your family. Tragedy should never exclude you from being used by God, in fact, it should qualify you more, and I urge churches and leaders to look past the situation and to the person and their potential. 3. When is it appropriate to inquire into another couples’ business regarding such a thing, and should we be responsible for holding others accountable if we suspect abuse? When is it appropriate to intervene if you notice something with another couple such as abuse? Here’s where one has to be careful. Abuse is a struggle to retain, or gain, control, and power in a relationship. So, those of us who are well-intentioned and want to implore our friends experiencing abuse in a relationship to get help need to take care that we aren’t unwittingly grabbing for that same control and power. It has to be their decision. There are loving ways to try and get them to see reality and do something about their unfortunate situation, but that has to be an invitation, not another type of coercion. Community is great when everyone is getting along, or someone in need receives help. However, when you have to confront someone or get them to confront someone else or themselves, it reveals the harder side of living life together, and it can often backfire. So, in regards to our relationships and marriages, we would do well to imitate Jesus and not create checklists or exceptions but focus on why marriage and friendship exist in the first place, to love, support, and make one another better. We can’t prioritize rules over people. I have been struggling with this issue. Marriage is a commitment and divorce isnt an option. I prayed and God answered with this message. Thank you! My marriage is not honoring God and is emotionally and mentally abusive…I know it is ok to walk away. God has other plans for me. I appreciate you sharing this. It means a lot to me as I struggled with feeling guilty for leaving my abusive relationship. As a believer I try to do the right thing at all times. The emotionally abusive relationship is a very good book about this subject. Helped me a lot. I think there should be more support groups.